Damien Hirst has said ‘art’s about life, and it can’t really be anything else’. In a series of memorable works, often involving provocative materials such as flies, dead animals and formaldehyde, Hirst has made uncompromising statements about the transience of life. In this room installation, he recreates the clinical atmosphere of a pharmacy. Hirst views medicine as a powerful belief system: we are seduced by drugs, believing they will cure all ills and preserve life, though rarely questioning their side-effects. I like the way art works, the way it brightens people’s lives up…but I was having difficulty convincing the people around me that it was worth believing in. And then I noticed that they were believing in medicine in exactly the same way that I wanted them to believe in art. We all die, so this kind of big happy, smiling, minimal, colourful, confident facade that medicine and drug companies put up is not flawless – your body lets you down, but people want to believe in some kind of immortality. The artist has chosen to make specific associations with parts of the installation. Pick one of the objects below to learn more about their meanings. The four bottles containing water and food colouring are traditional pharmacist’s symbols, representing the four elements, Earth, Air, Fire and Water. Their symbolic value, which enabled people to recognise the pharmacy before the days of mass literacy, can be compared to that of the striped pole outside a barber’s shop. By placing these old-fashioned bottles in a contemporary pharmacy setting, Hirst seems to be reminding us of the passing of time. As he explains, despite its clean, minimalist lines and modern medicines, this pharmacy will soon date: ‘In a hundred-years-time this will look like an old apothecary. A museum of something that’s around today’. I know the medicine cabinets work, but in many ways. I like all the readings, if you see them as power structures, a society, or as metaphor for the human body or even as a comment on capitalism or consumerism…or pro-medicine or anti-medicine – they are about all these things, even if you just think it’s weird to see them in a gallery. Someone was looking at the medicine cabinets, somebody who had worked as a nurse in a doctor’s surgery somewhere, and she stood looking at it, puzzling over it for ages… She said, ‘I can’t work out the arrangement.’ What she meant was, she’d worked with a lot of doctors who have their own personality. Basically, you can tell what kind of a doctor they are by the way they organise their drugs – what drugs they have closest to hand; where they shelve barbiturates and the other drugs you use with barbiturates, etc. But I was unaware of what the drugs do. I just put like with like. So I quite liked the idea that to a hell of a lot of people they looked so confident, but then to somebody who knows what’s going on, you know, it’s a mess. The cabinets are simple white shelves, arranged with empty bottles and packages of prescription drugs. The bottles and boxes on the shelves form blocks of colour (red, blue, orange, yellow, white) and although the artist has said that he doesn’t mind if the exact order is changed he thinks it is important to keep the colour balance. As the work is intended to convey the sense of being in a real pharmacy, it is important for the visitor to enter the installation at the desk, which gives the illusion of stumbling into a pharmacy from behind the scenes. 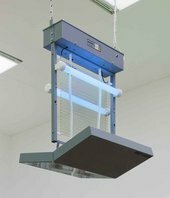 Hirst believes that the most important aspect of the insect-o-cutor is that it ‘symbolises some kind of god, something that kills without mercy, without emotion, without choice’. There are unlikely to be many flies in the gallery, but, according to Hirst, ‘visitors to the gallery act as flies, people as flies, like an overview of life without emotion, that is as far as the metaphor should go’. Hirst has related the cabinets to people, comparing the drugs inside them to internal organs, and commenting on the way many drugs relate to a particular part of the body. In some previous installations of Pharmacy, the cabinets were arranged to place drugs for head ailments at the top, down to those for the feet at the bottom. Four porcelain bowls containing honeycomb are placed on footstools. The honey can attract flies, which would then be zapped by the insect-o-cutor. When Pharmacy was first shown in New York, Hirst cut holes in the gallery windows to allow flies into the space. Honey was traditionally believed to have medicinal purposes. According to Hirst, the honeycombs reflect the natural, non-human world which is set against the man-made world represented by drugs and packaging. In an interview with Gordon Burn in London, on 3 October 2001, Damien Hirst discussed some of the themes and ideas behind Pharmacy. GB: Let’s go back to basics really – the whole thing about being in a chemist shop with your mum – her believing in medicine and the effects of medicine and not believing in art and thinking art was crap but believing whatever a doctor told her or whatever the packaging or medicines told her. How did you go from that kind of recognition to it becoming a ready-made or found art – isn’t that what Pharmacy is – I mean the medicine cabinets are ready-mades? GB: Out of the whole of life, the whole of everything in life that you see and experience, why did you pick on a chemist shop as a thing to pick? DH: For that very reason. I mean I suppose out of confidence, because people have confidence in [medicine]. Because I had a confidence in art that comes from God knows where – I was thinking I like this and I like the way it works, I like the way it brightens people’s lives up, the way that people believe in it, but I was having difficulty in convincing the people around me that it was worth believing in. And then I noticed that they were believing in medicine in exactly the same way that I wanted them to believe in art and they weren’t doing it. GB: What without any proof or backup at all for why they should believe in medicine? DH: Well, obviously there’s backup except they weren’t reading the side-effects – they weren’t looking at it logically. They were looking at shiny colors and bright shapes and nice white coats and cleanliness and they were going right – this is going to be my saviour. And it didn’t ring true – it didn’t seem believable. It seemed that art had a lot more going for it in terms of something that was going to heal you – it just seemed much more believable. It seemed to encompass more. I mean they don’t have cancer pills with a picture of a cancer victim on the front so that you know that’s for you because that’s the way that you look in the morning – they don’t sell it like that – they remove all the death when that’s basically what they’re all about. And it seems to me that you’ve got to face up to things. GB: I think the basic question is why in the arena of life, sickness, death – why was that the first place that you settled on to take a ready-made from? DH: I just think it’s so strong. It’s about confidence – it had such a strong confidence. I mean it’s about trickery – there seems to be a lot of trickery going on – it seems like there’s less trickery in art then there is in medicine. I think art is a hell of a lot better for you than medicine, in the long run. You don’t get a great long list of side-effects – or maybe you do! GB: You’ve also talked about the formal reasons for doing it – that the packaging was incredibly minimal and wasn’t sort of polluted by commerce. You have to have it – you can’t decide whether to pick it – you’re prescribed it – you don’t make a choice, you’re told that you’ve got to have it not that you want to have it. DH: In the supermarket there’s a massive battle going between brands – Coca Cola fighting KP Crisps – a big battle for attention and it’s very messy, it’s very ugly. Whereas in the chemist, they all harmonise with each other in a much more beautiful way, which is kind of what goes in artwork, so all the drug companies – they’re not fighting each other, there’s a kind of unwritten law. GB: When you’re in the back room of the chemist – not on the shelves. DH: That is on the shelves – you can see it – when you go to the pharmacist, they’re always open because they’re always using them all the while. And I was looking behind the chemist, over his shoulder and seeing all these packages on the shelves. GB: By and large you’ve got the commercial stuff in the front and the other stuff in the back. DH: Yeah in the chemist, it’s fighting like it is in the supermarket to a much lesser extent. DH: I like the idea of outside and inside – the medicine cabinets to be like people, with the drugs the internal parts and they kind of relate to different parts of the body. Life and death as a sculpture is a surprise and the acceptable look of it is a bigger surprise. I see the flies, well I actually didn’t use flies – but the flies could be people, as the bottles in the drug cabinets could. If you see people as flies you can seem them as butterflies - like either small and disgusting or fragile and beautiful. Something that has always intrigued me, in all the works, is the action of the world on things. The names of the drugs in the cabinets conjures up a vision of human misery and dread – with all the drugs there comes a reference to a particular sickness along with a list of side-effects. One drug, on the packet, for example carried a big warning – it said blurred vision, change in color vision – these were all the side-effects you could have, so it said like a warning – you think the drugs are perfect and they’re used to heal you and do everything they say – I’ve got a headache so I’ll take this. GB: They’re about degeneration and decline aren’t they? GB: And was that on your mind when you did the pieces? Thinking about the those kinds of negative effects as opposed to the positive effects? DH: When you’re installing something like that then you’re looking. You’ve obviously made the initial decision to get involved and create it anyway to begin with. GB: Were you aware, at that point, of drugs being seen as something that’s going to extend people’s lives? DH: No not really. I think it goes much deeper. It was more of an initial thing. GB: You’d already been to the mortuary and done all those sort of dead head and all those kinds of things – the morbid obsession had already started – you were already morbidly obsessed with death. Somebody obsessed with death is morbid – it’s from the same root, isn’t it? DH: Yeah well, we all die, so this kind of big happy, smiling, minimal, colourful, confident facade that medicine and drug companies put up is not flawless – your body lets you down but people want to believe in some kind of immortality. GB: Have you never spoken about the structure of the cabinets that hold the drugs? Because, that to me, seems to be as important as what’s on the shelves in a way? And I saw the Late Show and they were saying, ‘Oh they were really cheaply made’. I didn’t realise that they were a reproduction of a replica pharmacy cabinets. How far did you go into that – did you go into a company that made cabinets for pharmacies? DH: I just found an old sideboard that I liked and I made it in white. It was like a body, like an abdomen, a kind of bottom half and the top and the head. GB: You must have been interested in Donald Judd? DH: Yes, but I think the medicine companies were as well. 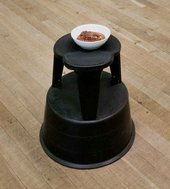 GB: Also people who made shelves for things to stand on – those New York artists you’d seen at Saatchi gallery in 1987 who would stand back and they were making shelves for things, and they putting things on shelves? DH: Yeah but there’s an element in medicine when you start realising that you’ve got to wash your hands before you start messing around with people’s bodies because you’re going to get an infection – so it creates a minimalism – you use minimalism to avoid infection. You know, you wear white coats because then you can see blood on it – you can see where all these things can start to occur. So that works in minimalism as well – like as a society that’s why that art makes sense. With clear forms and perfect edges then people can feel secure. It’s a confidence. GB: I never noticed that before. DH: Well that’s good. No, it’s true. GB: Something new. But I sort of realised that’s probably why it was, that people wear white. DH: Yes, or green, light green. They never wear red. It’s for that kind of cleanliness – but it can be physical as well as emotional or spiritual. I mean it’s your own decay which upsets you – it’s like an ashtray or when you wear your clothes in. GB: When did you start to make it into a whole room installation as opposed to just a one-off piece? DH: I think when I realised that an art gallery is like a shop. I said before once ‘the difference between an art gallery and a car showroom and art and cars – an art dealer and a car salesman’ – you realise that all these rooms are just rooms and they’re all the same – they have a similar function. You can clean out a hospital and make it into an art gallery – you can clean out an art gallery and make it into a doctor’s surgery. I was doing installations with the butterflies – kind of whole room environments – and I just thought that would be a great one to do. But also – just that directness – just to confuse people – if people are looking at art in one way and medicine in an another way and art has got the possibility to jump from one thing to another and to constantly surprise, whereas medicine doesn’t – it’s got to constantly deliver something which is going to heal you and there’s a lot of rules – whereas in art there’s no rules. And then to be able to turn an art gallery into a pharmacy, you get that surrealism. GB: You said, in New York, when you put Pharmacy up for the first time, you loved the fact that lots of people walked out of the lift, walked into the room, went like sort of it’s the wrong floor, got back into the lift, went down to the ground floor, came back up and went ‘oh yeah this is the sortie[?] of the show then’. Well, why did you like that? Why did you like that ambiguity and blurring? DH: Because I think that’s what’s brilliant about art – it’s to take the world as you know it and change it and represent it to you in a way you that you don’t expect it – I think that’s what art’s greatest function is. Art always has that power to make you think twice, to think again, to not know where you are, to loose your bearings. Again what we were saying at the beginning – there’s two things – I keep trying to leap back to two things. One is the confidence that it had, the simple confidence of it and the other was the confidence of the medicine cabinets in their own right. GB: Did the medicine cabinets come before or after Two Lovers? Did they happen at the same time? Because there’s obviously a direct link, it seems to me. DH: I did the medicine cabinets and then jumped back to them in the installation so there was a step on – the installation was after the formaldehyde pieces. I did the spot paintings, then the medicine cabinets, then the formaldehyde pieces and then after that I did Pharmacy as the installation. GB: So drugs was the link between them all? DH: Well drugs but also I always got a kick and still get a kick out of the fact that there’s no medicine involved in Pharmacy the installation and how much show is involved in the pharmacist and in the pharmacy and in the drug companies and the medical things. People’s belief is not in the drugs themselves, because in my installation the drugs themselves are not actually there, and it still creates that same context. GB: But certain people said to you that the piece would only work if the drugs were in the bottles inside the packaging? DH: But I think they’re wrong because there are very few bottles in a pharmacy obviously you can’t see what’s in there. I mean you only have to look at something like thalidomide to see how it can go wrong. GB: Do you think it’s seems more shallow because there is only packaging and nothing behind the packaging – in other words no real drugs inside the bottles and the boxes – I mean Anthony D’Offay said to you very early on…. GB: Or whoever it was ‘I’d buy the piece if it had the drugs in it’ and you said ‘Well it’s not going to happen – it’s not going to have the drugs in it’. DH: But as an artist, my interest is in the packaging, because obviously I’m not a pharmacist but then to find a very simple way to look at how this confidence works with medicine companies. What is your first reaction to Pharmacy? Is it a room in which you would feel happy to be left alone? What parts of the installation seem to you to be most important? How do you feel about calling this installation an art work? Damien Hirst has chosen an old fashioned pharmacy as the subject for this installation. Nowadays we would visit a chemist if we need to have a prescription dispensed or obtain medicines or tablets. Modern medicine has been a recurring theme in Hirst’s work, and it is art which, for him becomes the great healer, a replacement for God, a mind alterer, a potential placebo, a hopeful panacea. Explore other artworks by the artist in Tate’s collection. Can you find any other works where Hirst uses medicine as a subject? Pharmacy is an installation which displays great theatricality. We know that Hirst is interested in the effects of medicine and in this work he manages to create a ‘stage’ with a backdrop of bottles, boxes and other related instruments. We as viewers become the ‘visitors’, the ‘actors’ who participate in his play. What are the differences between the installations? How do these changes affect how a visitor might experience the work? Pharmacy with its clean, cool, floor-to-ceiling cabinet walls presents a realistic imitation of a chemist’s dispensary. At the same time however, the streamlined graphics of drug packaging and the ordered and formal presentation of the work suggests the language of art movements such as minimalism. The objects that make up Pharmacy – the glass display cases, the medicines, the desk, the telephone – are straight forward enough on one level, but the suggested themes and visual references make it a complex and mysterious artwork. Do you think Pharmacy is a realistic imitation of a chemist’s dispensary or an artist’s fantasy? The names of the drugs in the cabinets conjures up a vision of human misery and dread – with all the drugs there comes a reference to a particular sickness along with a list of side-effects. One drug, on the packet, for example carried a big warning – it said blurred vision, change in color vision – these were all the side-effects you could have, so it said like a warning – you think the drugs are perfect and they're used to heal you and do everything they say – I've got a headache so I'll take this. Do you think we are led to believe medicines are perfect and will heal everything? Do you think we only see the good things in medicines and ignore the bad things, the side-effects? Yeah well, we all die, so this kind of big happy, smiling, minimal, colourful, confident facade that medicine and drug companies put up is not flawless – your body lets you down but people want to believe in some kind of immortality. Have a look at some of the packaging which you can see on the various medicines and tablets. How does this kind of packaging differ from say, soft drinks or washing powder? Damien Hirst calls it minimal and believes it is supposed to inspire confidence in the consumer. Do you agree? What do you think of when you look at the packaging of these medicines? Is anything else packaged in this way? Look at Damien Hirst's series of prints The Last Supper. What is odd about this packaging? What does food packaging usually look like? In his discussion about Pharmacy, Damien Hirst speaks about mortality and the way in which some of us use medicines to stay young and to achieve immortality. Do you believe that we are so afraid of our own mortality that we will do anything, believe anything, take anything to prevent death? As a result of this discussion, you could design a packet for a particular medicine. Damien Hirst believes the minimalist packaging is part of the illusion of the medicine. Design some packaging that undermines that illusion. What would it have? Images? Bold colours? Flashy designs? People have confidence in [medicine]. Because I had a confidence in art that comes from God knows where – I was thinking I like this and I like the way it works, I like the way it brightens people's lives up, the way that people believe in it, but I was having difficulty in convincing the people around me that it was worth believing in. And then I noticed that they were believing in medicine in exactly the same way that I wanted them to believe in art and they weren't doing it. Can art heal? What do you think? Have you ever listened to a song, or read a book, or seen a painting that made you feel better about yourself or the world? Should it inspire you to think differently? Should art try to talk about everyday things and ideas? Is it good to question everyday things in the world? Should art make us think about things we don't want to face? Art often asks questions. Are there any questions or issues you would like to address through art? What form would your artwork take – a sculpture, painting, installation, photograph? Why have you chosen that form?